Today, for only the fourth time in the park’s 45-year history, Disney World will be CLOSED. Magic Kingdom, Epcot, Hollywood Studios, and Animal Kingdom (along with the water parks, the Disney Springs district, and the ESPN Wide World of Sports) will be closed all day Friday and into Saturday morning due to Hurricane Matthew. While Orlando, Florida isn’t directly in the path of the hurricane, the area is expected to get lots and lots of wind and rain. A trip to the happiest place on Earth right now is going to be very wet and soggy (and also dangerous, please follow all evacuations and shelter in place orders!!). All four of the parks actually closed down at 5 p.m. Friday afternoon, which is an odd thing to happen. It’s still daylight outside — though, in Friday’s case, a bit cloudy. 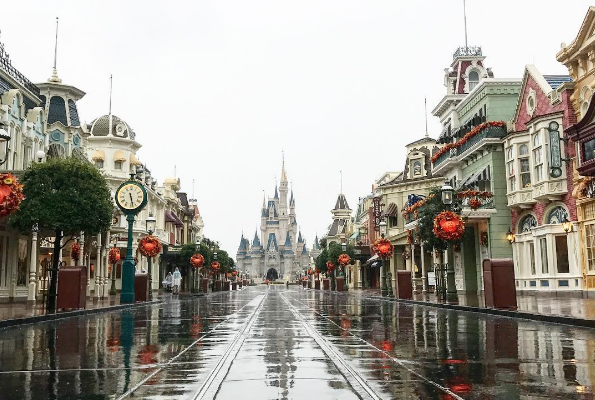 While it had already started to rain, many guests still headed out to brave the weather for a picture in front of the castle, and snapped some pictures that you need to see — because seriously, have you ever seen Disney World this empty before?